The Story of a Flower: From community member, to endangered species, to public enemy – Is it time for a new narrative? Every spring, as the days begin to grow longer and the weather consistently warms, my eyes start scanning the horizon for very specific plants, vegetative cues that mark the passage of time from one season to another. One of those plants is the Globe Mallow. Their presence marks the transition from spring to summer. 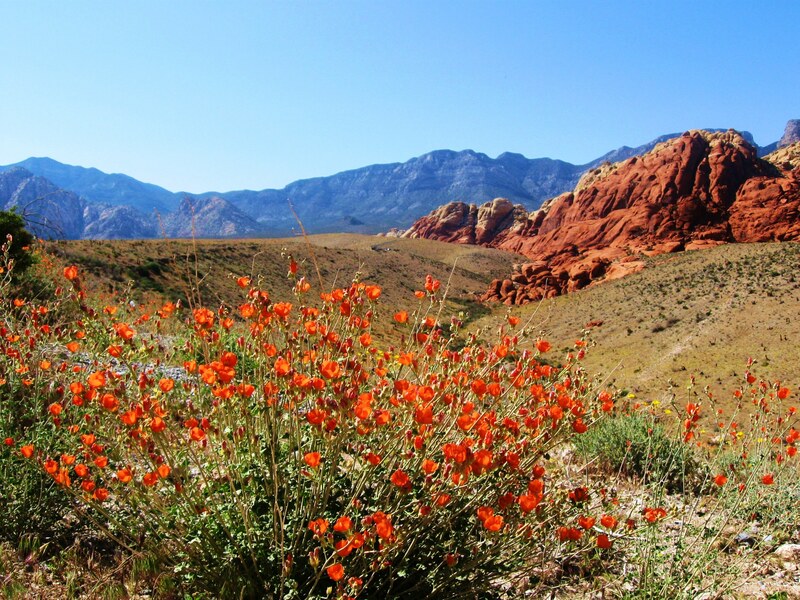 Bright orange bushes burst into flame along highways, freeways, and across the desert floor. They are flowers that you must see up close to truly appreciate. The small petals form little bowls, globes, or women’s skirts, that when filled with light, glow softly. Delicate like tissue paper, they are enchantingly beautiful. When they bloom I make a yearly pilgrimage with my boys to explore the changed landscape for the short period that they are blossoming. Though I don’t know much about the niche the Globe Mallow fills, or about the other species connected to or relying on them, they provide aesthetic pleasure, joy, and wellbeing to my life. I enjoy them. They are a part of the community in which I belong. They are a part of my story. If they suddenly disappeared, I would miss them, wonder about them, and seek to discover what had happened to them. They do not provide food or shelter and I’m not sure of their economic value, but they hold value to me. They ground me in time and place. 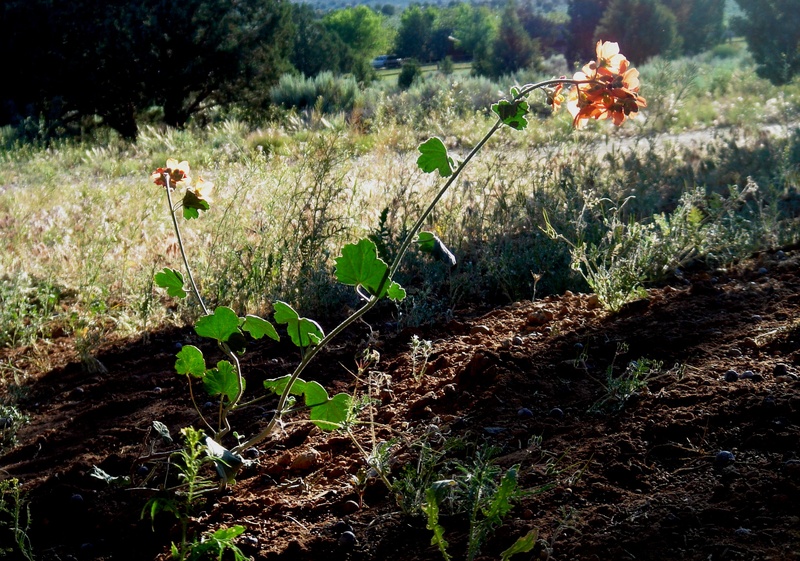 If the Globe Mallow was facing extinction I would feel an urgency to protect it. I would feel its loss before it was gone and would work to avoid that reality. If, however, a barrier was put around the flower that kept me away in order for the government to protect it, I would feel helpless. It would no longer be a part of the same world as the one I am in; it would be separate, sanctioned off. I would hope that the government would be able to ensure its existence, but I would no longer feel a part of its presence or protection. I could only hope. My interaction with it would be similar to looking at it through protective glass. Though not all species provide this sort of personal connection to me, all it would take to change that would be intimate knowledge. Kind of the same way a person changes from a stranger to a friend. For example, I know that if I rub creosote leaves between my fingers, it smells like rain. I know that sage provides a pungent fragrance that seems to permeate and rise up out of the earth. I know that right before autumn and a chill can be felt in the air, tarantulas come out. Knowing ones community happens subconsciously and almost intuitively, but turning that knowledge into love usually takes an act of conscious and willful acknowledgment and recognition. Often this is brought about through someone else’s actions, like the demolition of a hill. Sometimes is comes through absence, like when we move away. But without knowing a place, we cannot love it, and if we don’t love it, we won’t protect it, and if we don’t protect it, it will disappear. “Life is a miracle,” said Wendell Berry, “One kind of evil certainly is the willingness to destroy what we cannot make – life, for instance.” Life, including ours, plants, and animals, but also, the elements that sustain life such as water, soil, nutrients, and sunlight; in other words, the cycle of life and all of its interconnected parts and dependencies, is a miracle. Utter extinction, pollution to the point of poisoning life, annihilation of life giving properties, is unacceptable to us and virtually unfathomable, but it is happening. These changes are on a large and slow enough scale that if we choose not to see it, we won’t. But when we narrow the scope, bring it down to our own backyard, we can’t help but see it and be impacted by it. We need to take our backyard and apply it on a global scale to take what matters to us and expand it to the world; amplify it across borders and landscape to people and communities not so different from ours, and interestingly, not so far removed from ours either. Robert McKee said, “On one side is the world as we believe it to be, on the other is reality as it actually is. In between is the nexus of story.” This is the story of a flower, a close relative to the Globe Mallow, and some of the people living and working in proximity to it. Living in remote and small sections of the Mojave Desert in Utah and Arizona is the Gierisch Mallow, a rare and largely unknown flower found nowhere else on earth. It grows in a crusted, gypsum soil suitable only for unique species that holds nitrogen, moisture, and stays erosion. The flower is believed to be pollinated by the same bees that pollinate the Desert Globe Mallow, a flower found in much larger numbers throughout the southwest. The bees nest in the ground, within range of the flowers. A combination of evolutionary adaptations have produced a habitat suitable for the flowers to grow and survive in. Without the ability to travel the way we do, we might never have known of their existence. Last year the Gierisch Mallow was listed as an Endangered Species. Prior to the listing I attended a meeting held by the BLM for stakeholders who would be impacted by the designation. I attended to hear what the local ranchers and miners had to say. Knowing the general disdain for anything environmental in Utah and that the local ranchers and miners held strong beliefs about mankind’s role in it, I wanted to hear how they would articulate it and work within the confines of a government setting. As I watched the two groups, two distinct narratives formed in my mind: one was scientific, the other religious. The ranchers did not want the plant listed, and though the BLM employees were following a process, I presumed they supported the designation. Though the process is meant to be objective, deeply held narratives were driving it. One narrative is the desire to protect life through public policy based on scientific analysis and evidence, the other is the desire to maintain a way of life based on a belief that God gave us dominion over the earth. Though none of this was spoken, it was there under the surface. While the life of the flower was never directly discussed, and was actually never in question, how to go about protecting it was. The local miners and ranchers did most of the talking. They not only felt betrayed, they were worried about what the listing would mean for their way of life and bottom line. Realizing that the ranchers had been collecting seeds from the Gierisch Mallow and had been providing them to the BLM in an effort to work proactively, their anger and disappointment at an outside group requesting the designation and undermining their efforts was understandable. Though they never spoke of the fragility, beauty, or right of the flower to exist, it was clear that everyone recognized this by their preemptive actions in trying to protect the flower before the listing. At the heart of this meeting was a deep suspicion, based on collective experience, that one, the locals would carelessly trample the flower into extinction, and two, the government would come in and determine that the flower held more weight than the people living there. The locals were certain they could protect the flower that lived among them and pleaded their case. What they got was a bureaucratic answer that they could make comments during the scoping process and possibly sway the decision and course of action. Once the plant was submitted as a candidate, the land management agency was required by law to follow regulations to determine its status. The Endangered Species Act maintains that our natural heritage, plants and animals, have aesthetic, ecological, educational, recreational, and scientific value for this country and the people. Those are the values that get analyzed and discussed through the process of a listing. While the language appears to be inclusive, the Act ignores the relationship between people and the species and subsequently, the land. This exclusion of the relationship and personal narratives behind it makes the process sterile and impersonal. It isolates the species from the people, the place, and the ecological community they all belong to and makes it “other.” To compartmentalize the humans, from the species, from the land, is to keep all of the parts of a specific environment separate, and thus work against the end goal of maintaining the ecological health and integrity of the whole. Rather than using the local population to maintain and protect the plant, they are excluded. This segregation reinforces deeply held narratives that people hold to non-human life and to the earth. The narratives that shape people’s perceptions and attitudes are as varied as the people, but there are extreme ends in the environmental debate. Though there are many shades of grey in beliefs toward the earth, it is the stereotypical types on both ends that get all the attention. The extreme narrative of the bible-based religious demographic is that God gave humans dominance over the earth, that we were made in God’s image and that ultimately, humans take priority over all living and non-living life on earth. The extreme environmental narrative is that all living and non-living, non-human life has intrinsic worth and is equal in value to humans and therefore, should be given equal standing when it comes to decisions affecting it. When a species gets protected and it inhibits human behavior, industry, and livelihood, the two clash and depending on how the decision unfolds, ill feelings and antagonism result. This end result is bad for both sides because instead of finding sensible solutions in the future, the people will simply oppose each other over any policy decision. If these policies keep ignoring the narratives of the local populations affected by them, the deeply held beliefs will be reinforced and progress will face stiffer and stiffer polarization and legal battles. But when our decisions affect life, even if that life doesn’t seem significant, we need compassionate narratives that work creatively and ethically to protect the web of life, both human and non-human. It is easier to take an issue that obviously needs addressing, such as clean water, and have consensus, but protecting an unknown species can leave much open for debate. This is where policy fails us and story can help. As Robert McKee stated, “Values, the positive and negative charges of life, are at the soul of the art of storytelling. They can shape a perception of what’s worth living for, what’s worth dying for, what’s foolish to pursue, and the meaning of justice and truth.” It is not the worth of the flower or its existence that is at stake; it is the worth of the ones valuing that is at stake. At the core of environmental conflict is the messy relationship between people. Relating and finding common ground is easier done through narrative than policy because narrative allows empathy to surface. The gift of learning someone’s story is that it provides the opportunity to live lives beyond our own, to desire and struggle in a myriad of worlds and times, at all the various depths of our being (McKee, pg. 142). When we do that, we empathize and through empathy, link ourselves to another human being, testing and stretching our own humanity (McKee, 142). As I sat as an observer at the BLM office listening to the local field office employees and the local people, I wondered about the missing group, the one that had proposed the listing. While I was certain they had good intentions and their mission probably states a desire to protect all species, I couldn’t help wondering: Have they been out here? Have they even seen the flower? How different would it be if they had talked to the people impacted by the designation and had learned their story? I wanted to know if the flower was in danger of extinction due to human impact, or if it was just a rare species with a small population. As I let my imagination go, I imagined the people who live and work out in the Mojave Desert and what their life was like. I am certain they not only have stories, but history there, that is personal and intimate in a way that we can only relate to by comparing it to our own place. 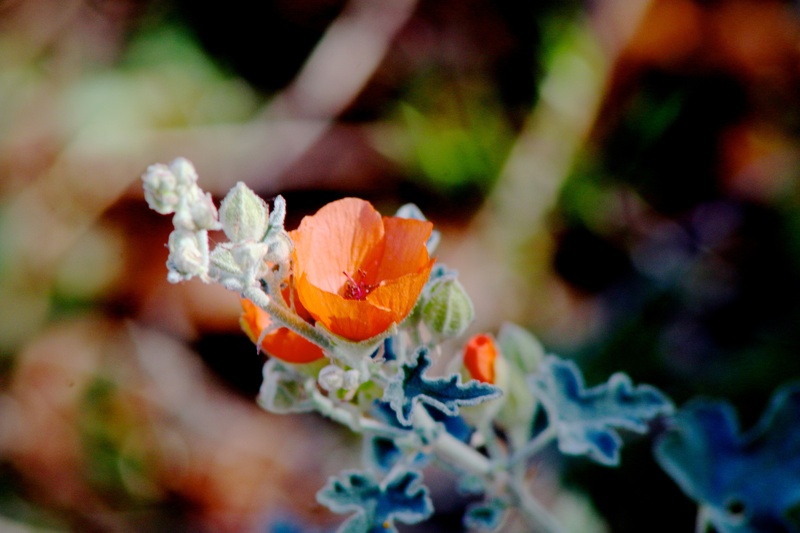 I was certain, that like me and the Desert Globe Mallow, the men in the room also know the seasonal cues, love the landscape, and are aware of the nuances of life found there. The plants and species are not just names in a database; In other words, the people living in these remote places are familiar with the species and landscape in a way that only a local could be. While they might shape their narrative along familial and traditional stories, and may even accept and include the growing scientific evidence as guidelines for their behavior, it is their personal story being threatened. The story of the Gierisch Mallow is not just of the flower and its beauty; it is about the beauty of the flower in context. The story includes the land, the inter-relationships of other species, and of the people who live and work in proximity to it. Depending on the narrative you subscribe to, the listing of the Gierisch Mallow is either beautiful or tragic, or perhaps it is both. In the reality of environmentalism, we are burdened by our heritage, but the story can be changed and rewritten to produce renewal and cleansing through humble, respectful, and well-told stories. The Gierisch Mallow is just one species of many that have been entered into the narrative of species protection and extinction and the people involved. How will it unfold? Will the locals harbor good or ill will toward it? Will they resent those designating it, despite their good intentions? Will their story be a happy ending or a tragedy? It will be determined through their narrative filter. The story is ultimately one of life and how we value it, both human and non-human. A flower offers a simple yet powerful metaphor for life. From time immemorial, flowers have been recognized for their beauty in scent, color, and form. In the short timeframe of their life cycle we see the duality of beauty and tragedy, life and death. They remind us of the passage of time. The word beauty originates from the Greek word hora, meaning ‘hour.’ It is associated with “being in one’s hour.” When a flower is in bloom, it is in its hour. The flower’s beauty, delicacy, and moment in bloom elicit an emotional stirring in us because the pinnacle of its beauty is fleeting. Because of the fleeting nature of life and the passing beauty in it, we often try to capture and prolong the essence of it through artistic reproduction, but art only makes static what is transitory. Like a stunning sunset whose beauty lies in its temporal nature, we relish it because it won’t last, but even if we could stop time, we would not want to live in perpetual dusk. It is the moment between birth and death, the passage of time that captures our imagination. Nothing we can do will prolong the scent of a lilac or the form of a rose indefinitely, but we know the cycle of the plants, we know that after death comes rebirth, and new blooms in time. Life on earth is, if nothing else, time. It is what we do with our time that will impact those after us. Like the flower, we have our hour, our time of beauty and then we too will pass. The question is: what high beauty, laughter and joy, or tragedy will come with our passing through? Will the audience in the future experience catharsis and pleasure when our act is done? In the drama of life we, humanity, are both the protagonist and the antagonist. We are perpetually in conflict, but history gives us perspective and clarity and helps us see and learn from the past. Through hind-sight we are able to see the comedic and tragic stories of people making decisions in time. We see their hour in history, and through theirs, we try to make sense of our own. Like a perennial flower, humanity continues generation after generation. We will bloom again as time marches on. Therefore, we should weigh our decisions with good humor, knowing that with each solved problem comes a new one, but with it, a new generation for that hour. We must recognize that while we have great technology and minds to innovate, we are not Gods, we are temporary and can only use the tools and information available to us. Perpetually fixing problems that we create is not wise, but operating with humility and wisdom on the front end and using foresight will help us in our struggles to live ethical and responsible lives. Protecting life might be a good place to start; connecting to people and places through story might be another. Whether trying to save the planet or save souls, it is the intricacy of life, the good and the bad, that we are working out. When it comes to the environmental narrative, the conflict is largely man against man. Our needs and wants conflict with our morals and duty to the greater community in which we belong. An inner story is played out in the heart and mind which shapes worldviews and determines actions. If we do not check our inner story against the larger story of life and look for the humorous, recognizing that true humor is laughter at oneself and true humanity is knowledge of oneself, we will lean toward the tragic and the vicious cycle will begin again. The virtue of humor is that it strikes at self-righteousness and produces humility that opens us up to more faith, and deeper belief and understanding. Humor is a sort of redemption in that we recognize that finality is the only real tragedy, but often what appears to be gone is just transformed into something new. The death of a flower is only a tragedy if it is never reborn, if it is gone forever. But there is a sort of joy that comes with the seasonal death of the flower because it invokes a longing in us as we recall it and know it will return. This awareness of nature results in renewal, restoration, and a sense of being grounded to something real and solid. The same is true of lost technology for new technology, lost employment for new opportunities and the discovery of new ways of life. The transition is often painful, but worth it in the long run. There is a certain hope that comes with the transitory because it alone holds the promise of change, growth, or improvement. The hope comes from knowing that we do not live in a static and unchangeable world. Though we may not think this deeply of the life and death of the flower, we sense it, feel it, and if we do think about it, we see the passing of time and our own life in it. As William Blake might surmise, we experience heaven, or a lifetime, in a flower. If we can find joy in the death and rebirth of a flower, then we can certainly see the tragedy in the flowers total extinction. While we cling to our own mortality and work it out through our own inner narratives, we must be aware that life continues after us and like ripples in water, our short existence plays out long after we are gone. Like the flower, we too need sunlight, water, nutrients, and the right environment to thrive, but unlike the flower, we are not benign, we have choice and the ability to change and impact our environment. We have changed and manipulated the most intricate details of living things, including flowers, all the way to landscapes and oceans. Our fingerprints are on everything, whether intentional or unintentional. We have been able to breed, cross breed, and graft plants in order to make them common and available, to patent for profit, and to manipulate and change for enhanced genetic traits, but the original is worth much more than any reproduction. We have learned that our tampering has far reaching consequences. Land change brings with it invasive plants that choke out native plants; removing forests changes the microclimate, impacts the animals, the soil, and the air. Through landscape or ecological restoration people are now trying to get back to the original, to the landscape before humans altered it. Brownfields, urban or industrial centers, are being restored to greenfields in an attempt to restore the land. While there is some question as to which point in time to restore a landscape due to the difficulty and uncertainty in identifying the original state, it is an attempt to get back to the original. But for the most part, once an original is gone, it’s gone. Though we are trying to fix what we ruined or changed, there is no creating a species out of thin air. We cannot make a flower ex nihilo, we can only take what already exists and create with it. As manipulators, tinkerers, movers, shapers, destroyers, and storytellers, we have a moral obligation to consider our actions with what we are unable to make: the original. If science is knowing, and art is doing, as Wendell Berry states, then certainly the process of environmental stewardship done well is the art of science in practice. Weaving many stories into the environmental narrative holds the most promise in ensuring that science is not void of compassion and values, and that people are not void of the knowledge that science provides. Otherwise, the single, narrow story will continue to be held, ensuring that an incomplete view and narrative is maintained. The narratives are what must be examined because they act as a the filter through which we view the world, make decisions, pass judgment, and ultimately, interact with each other. But they also hold possibilities to see new stories and expand our narrative paradigm. We are all human after all. We can relate to others through story, experiences, and values, but not facts. The narratives can act as the bridge between the process of decision making and the reality of those living with the decision. Though the process of science is supposed to be objective, often the people impacted by it are not and the subjective interpretation is what determines the discourse, compromise, and/or gridlock over such cases. The narratives and philosophies behind the people meeting to shape such environmental decisions lie beneath the surface. The objective analysis the stakeholders are meant to examine and engage in is limiting and will either reinforce or reshape already held narratives through the process. When the process cuts values out of the equation, it removes compassion for the particular creatures, people, and place in question. Without this compassion, the species at hand gets pitted against the people impacted. Because the beliefs, values, and morals are determined by many factors not easily defined or standardized by the government, the decision must be based on evidence and sound arguments that can be applied equitably and broadly. This makes sense from a policy perspective, but not an empathetic or understanding one. Life is complicated and messy, decisions are not easily made, but that is where there needs to be room for the non-scientific, non-economic, or non-concrete. The inherent value of the plant and the inherent value of tradition and way of life, while not openly discussed, are there. Those values should be included in the narrative of environmental stewardship because they are the threads that hold the community together in the first place. Perhaps we need to get to know our own place and community and weave our own story into it so that we can empathize with other places and people. I know that not everyone loves the desert the way that I do, but I am certain they love some geographical location somewhere in the world to the same degree. Stories of people and place fill volumes of literature that inspire and leave lasting imprints in the minds of people in all walks of life and from all corners of the world. It is time for story, normally relegated to classrooms, bookshelves, and coffee shops, used for study or leisure, to fill in the gaps between science and humanity, policy and citizens, and from person to person. Posted on August 12, 2014, in Connecting to Community and tagged BLM, community, dominion over the earth, endangered species, endangered species act, environmental narrative, environmentalism, extremism, Gierisch Mallow, Globe Mallow, place, Rober McKee, Wendell Berry. Bookmark the permalink. 2 Comments. On the right-hand side of the screen there is a “button” that says ‘Follow.’ If you click on that you will get notifications of new posts. Thanks so much.